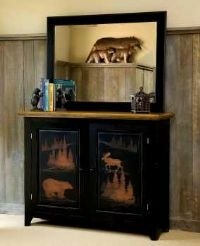 This cabinet would make a great addition to any room with a Lodge Theme! Lenght 46" Width 14" Height 36"
Unfortunatly, all our furniture is only available for pick up in our Gift Shop due to the large size and weight! Pick up Only at Gift Shop!